Mrs. Nancy Hite, 102 years of age, passed away Saturday, August 9th, at the home of her son, Mr. S.J. Hite, who lives near Emerson. Mrs. Hite was a native of North Carolina, and walked from that state to Georgia, settling in Cass (now Bartow) county, before the Indians were removed from this section. She spent nearly all her life in this county, and was a member of the Macedonia Primitive Baptist Church. She is survived by three children, Mr. S.J. Hite of Emerson, Mr. J.F. Hite, of Cartersville, and Mrs. May Cox of the Center community. The funeral was held Sunday afternoon at the Macedonia church, Rev. Sam Summey preaching the funeral sermon. NOTES: She was the wife of Wyatt Hite who died in 1862. 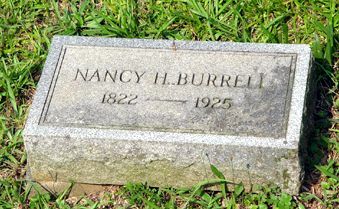 Records show that she married Thomas Burrell in 1873.